Perast is stunning. It is a must visit spot. Her Baroque architecture with white stone walls and red roofs contrast brilliantly with the clear blue water of the Boka Bay. If for no other reason than just to enjoy her beauty, she is worth a visit. 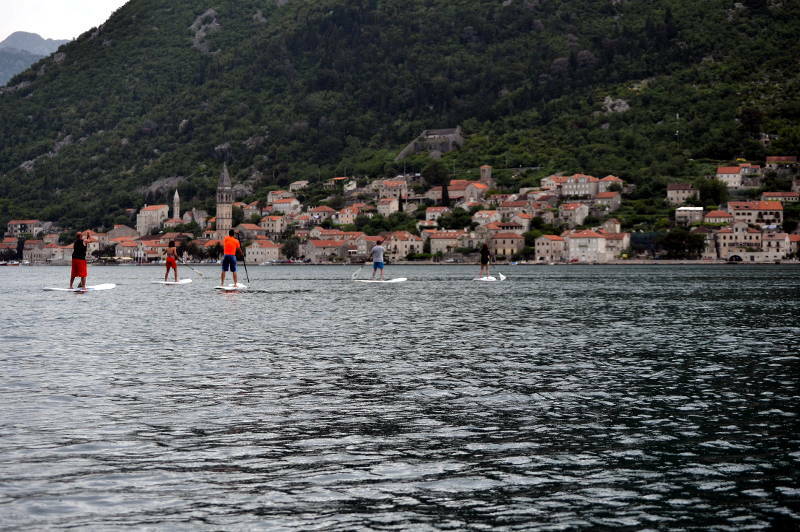 We stopped in the seaside town for a bit during a Boka Bay (Bay of Kotor) SUP outing with Montenegro+. Both in the approach and after landing, we drank in the architecture and grabbed a bite to eat at Hotel Conte. It doesn’t take long to be impressed with this place. The town itself is stunning. The water is perfect. And then, looking out on the bay a long swim away are two islands with a small church perched on each. The natural St. George Island and its respective church tread water gracefully along with the man-made Our Lady of the Rocks island and church. These two spots provide more intrigue and beauty to an already stunning landscape. 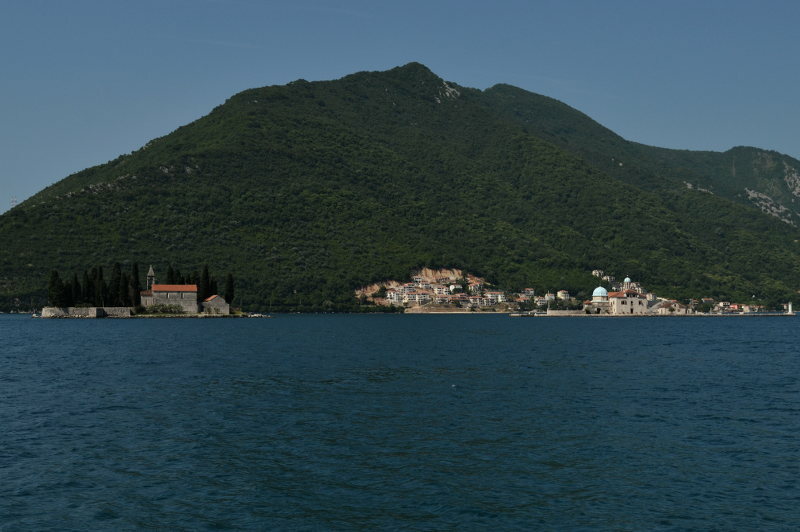 Perast is one of the oldest inhabited areas on the Boka Bay. Near UNESCO-heralded Kotor, this coastal town is ideal for access by land or water. In addition to coming into town by various sizes of sea vessels, you can also access the town on foot or via rented bike or eco car at the outskirts. Perast is close to the island churches of Montenegro. Nestled in the hill of St. Elijah, the city makes for some great photo opportunities as you approach from the bay. During our time in Perast we learned that, as in many towns along the bay, locals will rent out their apartments, villas, and rooms to guests, often bringing home baked gifts to their renters in the morning. With the beauty, seclusion, and hospitality, Perast has a strong pull with some of the glitterati. Tom Cruise has been seen here a couple of times leading many to reason that he owns property here. Also, Michael Douglas and Catherine Zeta-Jones have openly shared their interest in buying property in this usually quiet, coastal town. 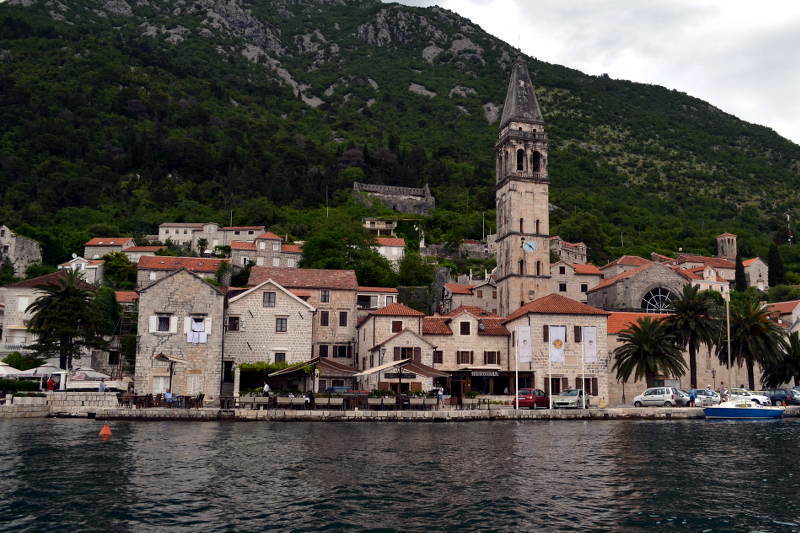 While individuals seek a place in Perast today, empires fought for control of the city through the centuries. She has waved a Byzantine, Venetian, Serbian, Austrian, Hungarian, French, Yugoslav, and Montenegrin flag through her 1,000 plus year history. 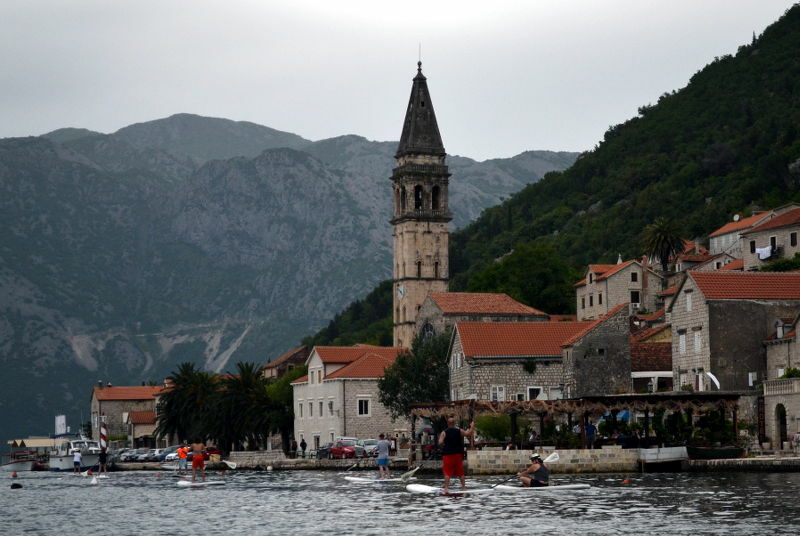 Whether you are looking for a quick place to stop for a bite to eat along the bay, an excellent picture spot, place for a stroll, or an extended vacation along the water, Perast has something to offer. Enjoy a scenic day on the water like we did with paddle boards and come in from the water or make your way in by foot or bike after reaching the outer limits of town. Notes: Restaurants accept customers regardless of their appearance. The nice people at the lush Hotel Conte invited us inside while we were dripping wet and shoeless. This was yet another example of the hospitality of the country for our hungry, inspired traveling crew.